The rising awareness regarding the use of biomass as a suitable low-carbon and sustainable alternative to fossil fuels such as coal for the generation of power and heat is the key driver of the global biomass boiler market. Developed as well as developing economies across the globe have ramped up their efforts for reducing greenhouse gas emissions, of which finding ways of minimizing reliance on fossil fuels and switching to carbon-neutral fuels such as biomass is an important step. This trend has led to an increased adoption of small- and large-scale biomass boilers across the globe, chiefly for the generation of heat and power across businesses, households, and communities. Transparency Market Research estimates that the global biomass boiler market will expand at a remarkable 18.1% CAGR from 2016 to 2024. The market had a valuation of US$2,426.5 mn in 2015 and is expected to rise to US$10,752.4 mn in 2024. Of the key varieties of biomass utilized to fuel biomass boilers, including woody biomass, urban residues, biogas and energy crops, and agriculture and forest residues, the segment of woody biomass is the single most abundantly used source for generating power and heat in biomass boilers. The segment accounted for a share of nearly 77% in the global biomass boiler market in 2015. Woody biomass has been traditionally burnt directly for domestic heating and cooking purposes; however, owing to the introduction of new technologies, it can be now converted competitively into electricity. However, the high use of woody biomass comes with concerns such as climate and air pollution. This factor is expected to hamper the use of woody biomass to a certain extent in the next few years, especially for power generation purposes. As a result, the share of woody biomass in the global biomass boiler market is expected to witness a marginal reduction in the near future. The segment is likely to lose its share to emerging feedstock segments such as agriculture, forest, and urban residues. Europe is presently the dominant regional market for biomass boilers in terms of the overall contribution to the global market’s revenues, standing at over 67% in 2015. The region is expected to continue its promising run in the near future as well, exhibiting an 18.8% CAGR over the period from 2016 to 2024. The market is well developed in European countries such as Sweden, Finland, and the U.K. the vast rise in biomass production in the region is the main driver of the excellent sales of biomass boilers in the past and is expected to drive the market in the next few years as well. Of the variety of feedstock used to run biomass boilers in Europe, woody biomass is the most preferred variety. 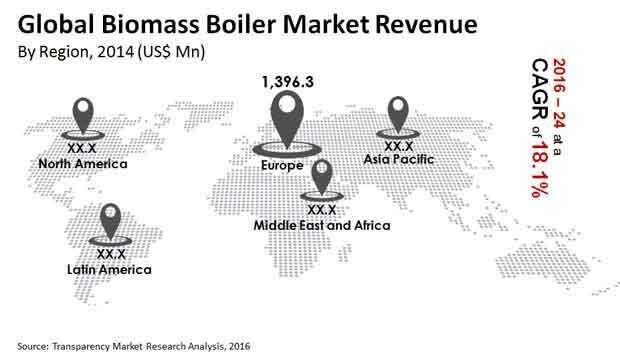 Trailing Europe was the biomass boilers market in Asia Pacific in 2015, which held a nearly 16% of the global market’s revenues in 2015. The market for biomass boilers in the region is expected to exhibit a noteworthy 16.6% CAGR from 2016 to 2024. Aggressive renewable energy targets set by developed as well as developing countries in the region, vast rise in demand for energy, and an encouraging regulatory framework are among the key factors driving the biomass boiler market in Asia Pacific. Promising government policies related to the development of biomass energy in these countries will act as catalysts of growth of the Asia Pacific biomass boiler market across the forecasting horizon. Some of the key vendors operating in the highly fragmented and intensely competitive global market for biomass boilers are General Electric Company, Advanced Recycling Equipment, Inc., Energy Innovations (UK) Ltd., ETA Heiztechnik GmbH, Amec Foster Wheeler plc, Hurst Boiler & Welding Co, Inc., Baxi Group Limited, Ecovision Systems Ltd., and Thermax Ltd. The biomass boiler market report by Transparency Market Research provides in-depth analysis of the biomass boiler market globally in terms of revenue (US$ Mn) based on the annual sales of biomass boilers. The market for biomass boilers has been segmented on the basis of feedstock type, product type, end-user, application, and country/region. The market based on feedstock type, has been segmented into woody biomass, agriculture & forest residues, biogas & energy crops, urban residues, and others. On the basis of product type, the market has been segmented into stokers, bubbling fluidized bed (BFB) boilers, and circulating fluidized bed (CFB) boilers. On the basis of end-user, the market for biomass boilers has been segmented into residential, commercial, and industrial sectors. For residential and commercial end-user segments, we have considered boiler sizes/electrical output of 0.01 MW to 1 MW and for industrial end-user segment we have considered only those boilers with an electrical/heat output of 1 MW to 5 MW. Major applications of biomass boilers considered in the report are heating and power generation. The regional segments included in this study are North America, Europe, Asia Pacific, Middle East and Africa, and Latin America. These regional segments are further divided into country-wise segments. The report provides a detailed growth forecast for the period 2016-2024, considering 2015 as the baseline year. Projections have been provided for revenue (US$ Mn) through the annual sales of biomass boilers. The report also provides historical data of the biomass boiler market for the year 2014. The report includes the key market dynamics affecting the demand for biomass boilers. As a part of our market dynamics analysis, we have analyzed the market drivers, restraints, and opportunities. A comprehensive competitive landscape, which includes company market share analysis and market attractiveness analysis, has also been provided in this report. The report also provides a detailed industry analysis of the global biomass boilers market with the help of Porter’s Five Forces model. The Porter’s Five Forces analysis aids in understanding the five major forces that affect the industry structure and profitability of the global biomass boilers market. The forces analyzed are the bargaining power of buyers, bargaining power of suppliers, threat from new entrants, threat from substitutes, and degree of competition. The study also includes the value chain of the global biomass boiler market which provides a glimpse of key suppliers, manufacturers, distribution channels as well as interaction of suppliers and buyers with end-users. The company market share analysis has been done considering the revenue and global penetration of key market players in the biomass boiler industry. The attractiveness involves benchmarking and ranking each technology and region on the basis of numerous parameters. The parameters selected are likely to have a pronounced effect on the demand for each technology in the current scenario as well as in the near future.